With the writing on the wall for Sony’s PlayStation Vita, it is likely that there won’t be very many games released for a platform in its twilight years. Even more rare will be physical editions of games that will be released for the handheld. But perhaps the rarest releases of all will be collector’s editions. Well, Degica Games has announced its plans to team up with distributor Limited Run Games for a collector’s edition of one of its upcoming Vita releases. Nurse Love Syndrome will release in very limited quantities on April 19, 2019. You may be thinking, “Just how limited will this run be?” Well, there will be two scheduled batches up for sale. The first will be launched at 10 AM ET, while the second batch will begin selling at 6 PM ET the same day. For those who have an interest in nabbing a very limited edition of a Vita game before the platform stops seeing physical releases, this is one of your last chances to do so. Otherwise, you might end up having to bid snipe on eBay or something to find copies after this staggered sale. 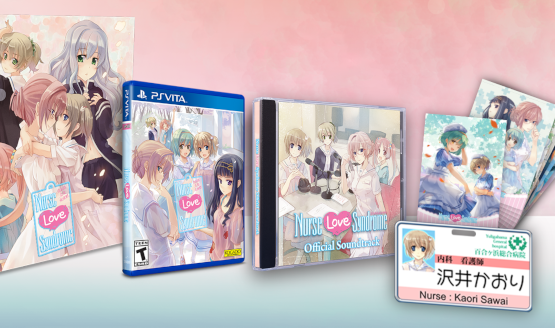 What’s included in the Nurse Love Syndrome Vita limited-run collector’s edition? According to Degica Games, buyers will receive a copy of the game, a soundtrack CD (yes, a physical CD), eight trading cards, and a Kaori Sawai ID badge. No mention of price was given, but hopefully it won’t break the bank! For those who may not know, Nurse Love Syndrome is a visual novel, wherein players guide protagonist Kaori Sawai as she leaves nursing school behind and begins a career at the Yurigahama Hospital. The story is written by two real-life nurses: Sakura Sakura and Madoka Madoka. Nurse Love Syndrome also takes place in the same world as 2017’s Vita release Nurse Love Addiction. Assuming you’re a fan of the visual novel genre, will you be picking up Nurse Love Syndrome’s physical collector’s edition? Or are you only going to download a copy of the game? What would make the collector’s edition a better buy? Leave your thoughts in the usual spot.